The Gateway Peekskill Condominium is a mixed income development with 16 residential units including two affordable units. The affordable units are two bedroom condominium units. They are townhouse style with +/‐1648 SF and two bathrooms with an attached two car garage. These condos are three story units with the ground level consisting of a two car garage, a foyer, den, laundry and mechanical closet and entry closet; the second floor consists of a family room, dining room, kitchen, bathroom and pantry closet; and the third floor consists of a master bedroom, bathroom, a bedroom and linen closet. Each unit will be heated by a forced air system. Hot water will be furnished by a 50 gallon natural gas fired hot water heater. Air condi⯑oning will be provided to each unit. The condensing units are located on the roof of each dwelling. The units include a refrigerator, dishwasher, oven/range, microwave and hook‐ups for a washer/dryer. 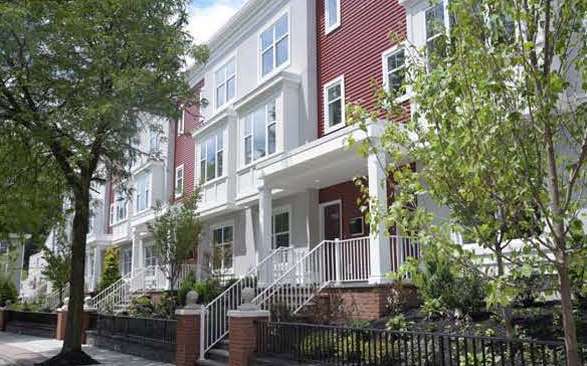 These newly constructed condos are in the City of Peekskill at 704 and 716 Main Street. Peekskill is located in northwest Westchester County on the bank of the Hudson River and is just under one hour north of New York City. Peekskill has a growing arts community and hosts the Paramount Hudson Valley Theatre and the Hudson Valley Center for Contemporary Art. Gateway Peekskill Condominium is conveniently located off of Route 9 which is a major north south highway. The Peekskill train station (Metro North Hudson Line) is within 0.75 miles. Peekskill is served by several bus routes which include Route 18 which provides transportation from the railroad station, through downtown Peekskill to the New York Presbyterian Hudson Valley Hospital on Route 202. Bus routes 14,15 and 17 operate between Peekskill and White Plains. A major supermarket is located in the Beach Shopping Center in downtown Peekskill along with dining and entertainment establishments, pharmacies, banks and other retail. There is also a Farmers Market. The City’s Parks & Recreation Department offers adult programs, including lap swim, volleyball, yoga and tennis, youth basketball and a pre-school program. Bear Mountain State Park and the Blue Mountain Reservation are close by as well as a downtown riverfront park. Students will attend schools in the City of Peekskill School District — Uriah Hill, Jr. School serves Pre‐K, Oakside School, Grades 2 and 3, Hillcrest School, Grades 4 and 5, Peekskill Middle School , Grades 6, 7 and 8 , and the Peekskill High School, Grades 9‐12.